Bike the Bridge! 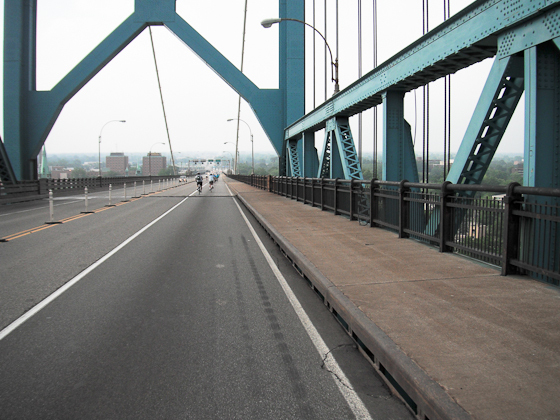 The Ambassador Bridge company has once again agreed to close a lane down for cyclists to cross on their bikes, making it the only time you can ride your bike across the international border between Windsor and Detroit. This year’s event will take place on June 17th and tours are planned to commemorate the bicentennial of the War of 1812. The border between the American town of Detroit and the British colonial settlement on the south shore of the Detroit River played host to some key turning points in the War of 1812, from General Hull’s crossing at Belle Isle to the Capture of Detroit, a couple of kilometres upriver. The town of Amherstburg and the fort therein also hold special historical significance. Tours of these historically rich locations, geared towards cyclists of all ability levels, will be available for participants of this year’s Bike the Bridge event. Before riders take off they will be able to enjoy breakfast prepared by locally owned and operated cafe Trés Bean. Riders will also receive a commemorative t-shirt. The organization of the event is a partnership between the Windsor Bicycling Committee and representatives of the Michigan Trails and Greenways Alliance. Proceeds from the event go towards building a statewide system of recreational trails in Michigan, and the ride promotes both Windsor and Detroit as prime cycling tourist destinations. Deadline for registration is this Friday June 1st, 2012, and the cost of the event is $65. Participants must be at least 16 years of age and have a valid passport/Nexus card/enhanced driver’s license. Helmets are required for this event. Visit their website for more info and to register!